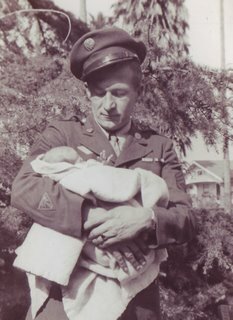 Here's a picture of me taken soon after I was born with a man in an army uniform. A staff seargent with some kind of communications patch on his sleeve. Palm trees in the background so it could be California. My mother says the man is my father. Could the soldier be Marlon Brando? Brando was known to hang out in Southern California sometimes, so that's a good possibility. Maybe my father is Italian soccer player Alessandro del Piero -- currently playing in the World Cup -- though this seems less likely since Alessandro wasn't born until 1974 and the picture appears to be somewhat earlier. Perhaps it's Yasser Arafat in a crafty disguise. Other likely matches are Jon Stewart, Chuck Yeager, George Clooney, and Luciano Pavarotti. Those are the possibilities listed at myHeritage which uses "sophisticated algorithms that facilitate the use of face recognition for genealogy." I don't have any sophisticated algorithms. To me, he looks a lot like the guy my mom has always called Fred and I've always called Dad. According to the National Web Site of Wales, the recent completion of U.S. census records on Ancestry [Ancestry.com] will result in boatloads of Americans beating the bushes in Wales searching for their ancestors. "Americans are very intrigued about Wales and their Celtic ancestry. If they feel they have half a toe in the Celtic gene pond, they'll be beside themselves with excitement and hot-footing it over here to get more." Tom Cruise's Welsh ancestry was questioned here and also revised on ancestry.com. The Welsh site says Tommy Lee Jones's father, Clyde Jones, was Welsh. Clyde was born in Texas in 1926. Both of Clyde's parents were born in the U.S. as were all four of his grandparents, all eight of his great-grandparents, and a good chunk of his family tree for several more generations. Because the origins of most of his ancestors are unidentified, we don't know how many of these lines actually led from Wales. Kevin Spacey says his great-grandfather was a Welshman named Spacey. Actually, his grandfather Joseph emigrated from Bohemia as a toddler. He changed his name from Spacek to Spacey when he was in his 30's. Half a toe, indeed. Some of those Welsh bits are quite rare. 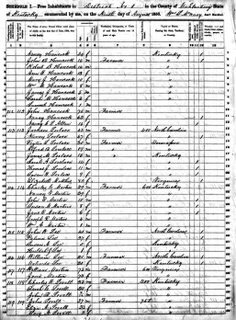 In 1930 [census], Golda Hitchcock Bradfield lived with her carpenter husband and five children in their rented home on a tree-lined street in downtown Emporia, Kansas. Three more children would be born in the next five years. In the coming decades, the family would learn that Golda had passed on a deadly inheritance. Golda died of a rare stomach cancer at age 64. Of her eight children, seven would have the gene that makes the disease almost inevitable. Six of the kids died of it, most in their 40s or 50s. The next generation -- Golda's grandchildren -- watched helplessly as the older generation died too young and wondered what the future held for them. With the advent of a genetic test for the disease -- and the death from stomach cancer of one of that generation -- the remaining cousins were tested. Eleven of them were found to be at risk. Each of them had to decide whether or not to accept the only available option -- to have their stomachs removed. A drastic step but eventually they all took that option. "We're all going to die of something," Bill Bradford said, "but I know I won't die of stomach cancer." A recent reviewer of political commentator Ann Coulter's latest book threw down the genealogical gauntlet by suggesting that Coulter could be descended from Hitler's propaganda minister, Joseph Goebbels. That is patently absurd and was obviously written just to stir up trouble -- yet I did take up the challenge. 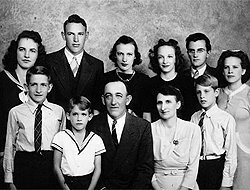 I found that Coulter's ancestors, at least on her mother's side, are red-blooded Americans, having been in this country for hundreds of years, and have probably never set foot in Germany. Coulter's mother is Nell Martin Coulter, born in Paducah, Kentucky in 1928. 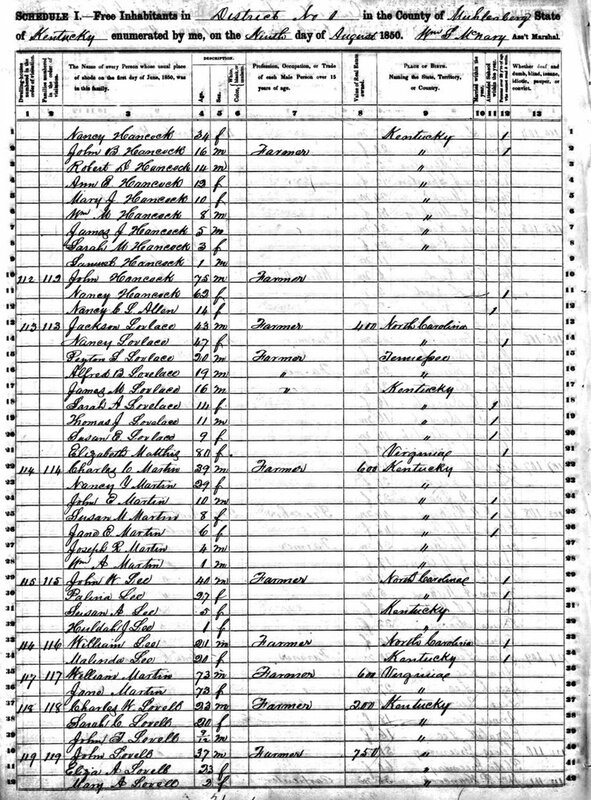 On the 1850 census, Nell's great-great-grandfather, Charles C. Martin, is a farmer in Muhlenberg Co., Kentucky. 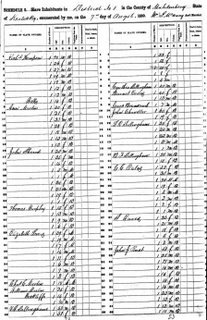 He's also on the 1850 Slave Schedule for the same location, the owner of one 18-year-old mulatto male. In its new ad campaign, Genworth Financial is spotlighting the lives of 6 centenarians. According to the WSJ, this is a bold move. Conventional wisdom among marketing types is that Baby Boomers are turned off by reminders that they are getting old. I rather like it -- beats the alternative. One good thing about old folks is that they have more history that can be checked out. Here's what the records show for the new advertising models. A retired doctor, Frank's wife, Bernice Deer Shearer, died in 1996 on her 92nd birthday. 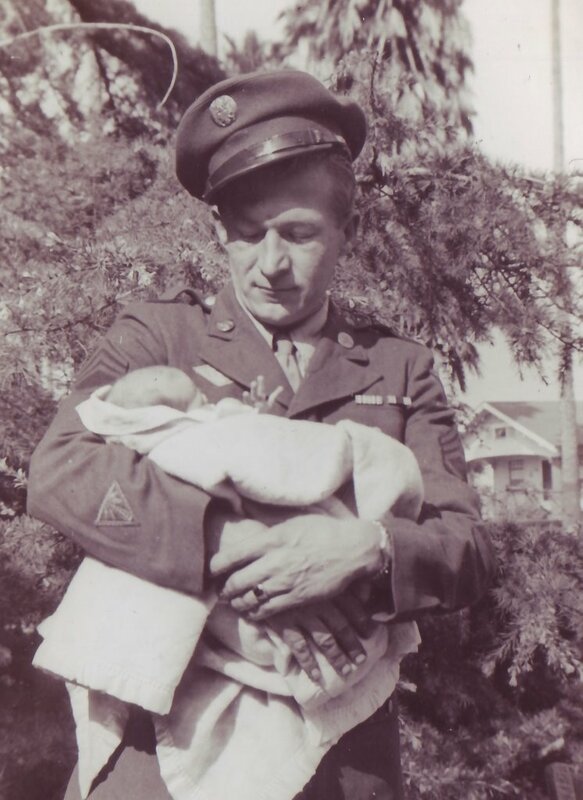 He was born in 1905, most likely in Saskatchewan, Canada. The first Canadian census he'll appear on is 1911, which will be released to the public in 2011 at which time Frank will be 106. When The Genealogue generously shared with us that Sen. James Inhofe (R-OK) claimed there'd never been a divorce in the recorded history of his family, you know I had to check it out. This is from the October 20, 1949 edition of the Council Bluffs Nonpareil (Council Bluffs, Iowa). Lorence Inhofe is the senator's first cousin. Did George Raft make up his Italian ancestry or was it his devotees who did it as Italian American Actors suggests? Fan-written Wikipedia says that George Raft had an Italian mother and the FBI says he is Italian, but the American National Bibliography says Raft's parents are Conrad Ranft and Eva Glockner. With this conflicting information, I could not help but want to check it out. I was surprised by what I found. In 1910, George is with his parents Conrad and Eva Ranft in New York City. His father says he was born in Massachussets and his mother says she is from Germany. The parents give the same birthplaces in 1900. So that confirms it: George Raft had no Italian ancestry. But what's surprising is that he is only 8 years old in 1910 and does not appear at all in 1900. Practically every source has his birthdate as 26 Sep 1895. Even his gravestone and California death record say 1895. So now we have evidence that George lied about his age and everybody fell for it. All we have to do is verify it. The social security death index has his birthdate as 26 Sep 1901. The dates on the California death record and the tombstone were provided by someone else, but George himself provided the date to the Social Security Administration, probably along with proof of age. The index to New York City Births records a George Rauft born 26 Sep 1901. Remember, George's real name was Ranft. 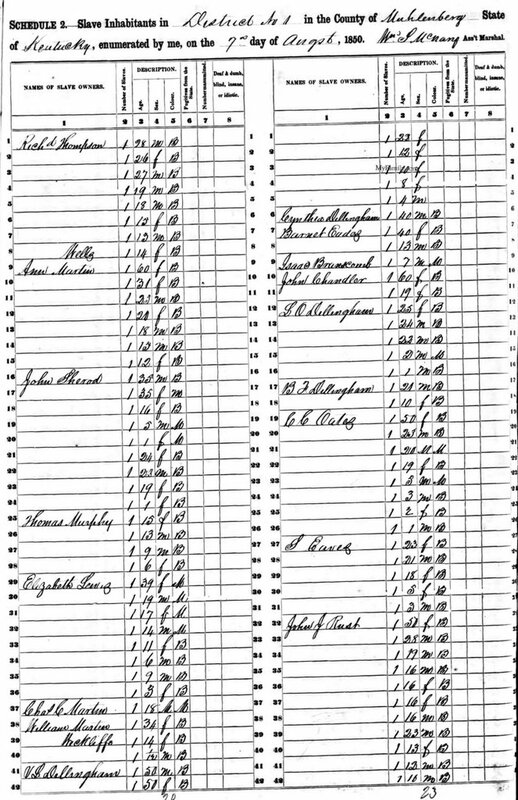 If, like me, you spend all your spare time looking at census records, you know that an N and a U look the same. Someone who wants to write a biography of George might want to examine the actual birth record, but that's enough evidence for me.